IBM Rational is the leading software development brand that supports Global Development and Delivery (GDD) (also known as Geographically or Globally Distributed Development). At Rational Bangalore, we not only practice GDD ourselves, but we also help our customers overcome their GDD challenges. 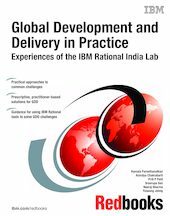 This IBM Redbooks publication presents our collective experiences with GDD: the common problems, the tailoring of Rational tools to solve the problems, and best practices and case studies. This book is intended to help both new and experienced practitioners of GDD by addressing the pain points of GDD and providing solutions.